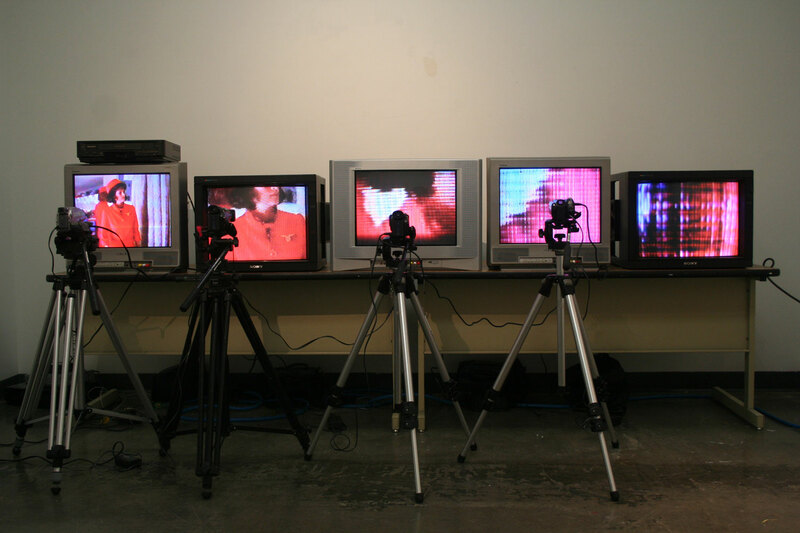 This workshop supports study and production in the media arts, including digital video, sound, installation/performance, and Internet and new media art, for students with a range of experience with media technologies. Conceptual development is stressed through regular readings and screenings, while technology skills are built in hands-on workshops using a range of media production equipment and platforms. In class and short-term projects lead to the development of a significant final piece of work that may relate to students’ ongoing creative interests. In my work, I have been most strongly aware of the camera as representation of point of view…But I have been interested in how we can move this point of consciousness over an through our bodies and out over the things of the world…I want to make my camera become the air itself. To become the substance of time and the mind. Each pair will have a week to create a video exquisite corpse, using the camera to record images grounded in a specific point of view and individual, subjective position. Use the camera’s manual functions in an intentional and controlled way, developing fluency with exposure and focus controls such that technical “imperfections” are clearly intentional, expressive effects. Atmospheric, personal, evocative imagery tends to work best for this project. Try to avoid a “home video” or “broadcast video” look. Plan your shots in record standby mode before hitting record. Check for exposure, focus, and timing. Consider the sequence of shots before you begin. You may edit by deleting mistakes, but you cannot reorder the sequence of shots. Keep in mind that shots that seem short in camera may feel excessively long to the eventual viewer. Camera movement can be distracting and/or nauseating to the viewer. Have someone on hand to help you with camera operation or to manipulate items, but try to avoid letting the person immediately before or after you in your group see what you are shooting. Disable the audio on your camera. Emily Dang (BFA, Drawing), Buffy Quintero (PhD, Interdisciplinary Studies), and Sarita Zaleha (MFA, Printmaking), Fall 2014. Ian Abrams (BFA, Drawing) and Terrence Quinn (BA, English), Fall 2012. Lisa Johnson (MFA, Sculpture), Rudolfo Salgado (MFA, Printmaking), and Taryn McMahon (MFA, Printmaking), Fall 2010. Even though you will be editing the footage and have a vast palette of effects at your disposal, continue to pay careful and close attention to the content, aesthetics, and quality of your source imagery. To that end, you’ll be shooting during week one and editing in week two. Jenny Braun (MFA, Printmaking), Fall 2013. Christopher Willauer (BFA, Intermedia), Fall 2013. Rachel Livedalen (MFA, Printmaking), Fall 2012. Felicia Chavez (MFA, Nonfiction Writing), Spring 2011. Lauren Street (BFA, Photography), Fall 2011. Jeff Palmer (MFA, Film/Video Production), Fall 2011. This assignment asks students to tune into the aesthetic potential of sound composition while introducing fundamentals of field recording and audio composition. Variations have included audio ‘postcards’ – descriptive and evocative dispatches from a specific place, ‘sound stories’ – narratives in which the visual is subordinate to the sound, and thematic, collaborative sound investigations. Naoki Izumo (MFA, Intermedia) and Jared Jewell (BFA, Intermedia), “Manufacturing War,” Fall 2014. 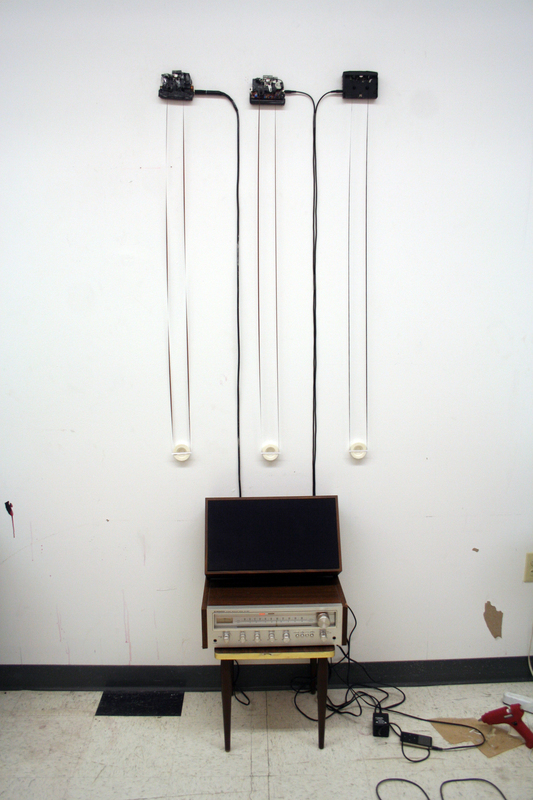 Erica Blair (BFA, Intermedia), “Abstract Audio Postcard,” Fall 2012. Derek Blackman (BFA, Photography), “Anxiety,” Spring 2011. Anna McDermott (BA, Film/Video Production), “Space for Conversation,” Fall 2011. The class sometimes includes an installation component, especially when paired with Intermedia’s public Fall Showcase event. Due to space limitations, the students have only one week to develop the installation component. 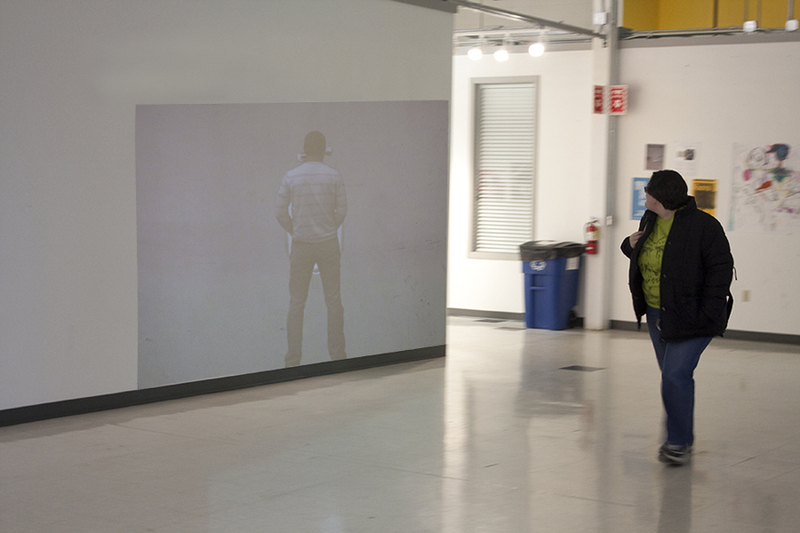 Lev Cantorel (BA, Art/Cinema), Jason Renaud, (MFA, Sculpture) and Sarita Zaleha (MFA, Printmaking), “Surface Surrender,” audio installation, Fall 2014. Emily Dang (BFA, Painting/Drawing) and V.K. 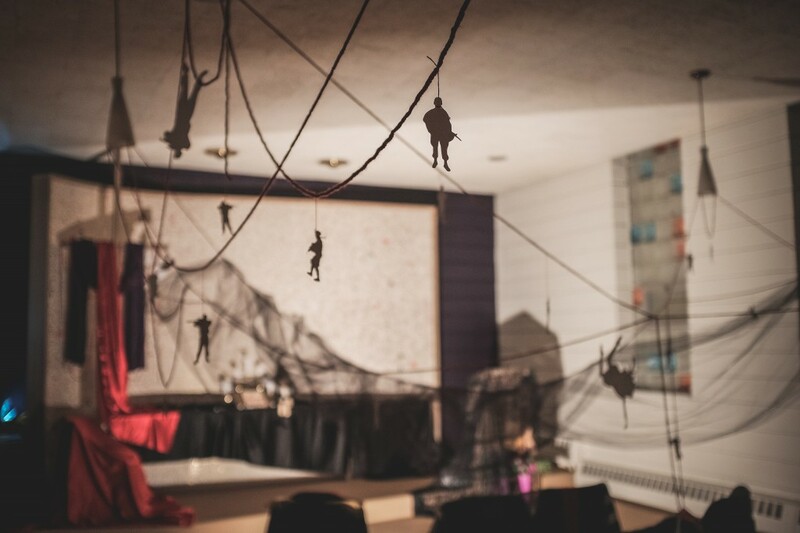 Tian (BA, Art), “24 Hours,” installation of the audio work shown above, Fall 2014. Matt Borger (MA, Graphic Design), Katie Hargrave (MFA, Intermedia), and Stephen Crompton (MFA, Photography), “I Surrender/Make Your Own,” installation with live-projection of audience flag drawings, Fall 2011. Dan Feinberg (MFA Sculpture) and Josh Hoeks (MFA, Sculpture), “Down He Goes,” site specific installation with mechanical arm “flushing” video image into a bucket of water, Media Art Lab Fall 2010. Douglas Degges (MFA, Painting), Felicia Chavez (MFA, Nonfiction Writing), JJ Meyer (BS, Computer Science), and Alyss Vernon (MFA, Photography), “Port-a-Potty,” life-size projection in Studio Arts lobby, Spring 2011. 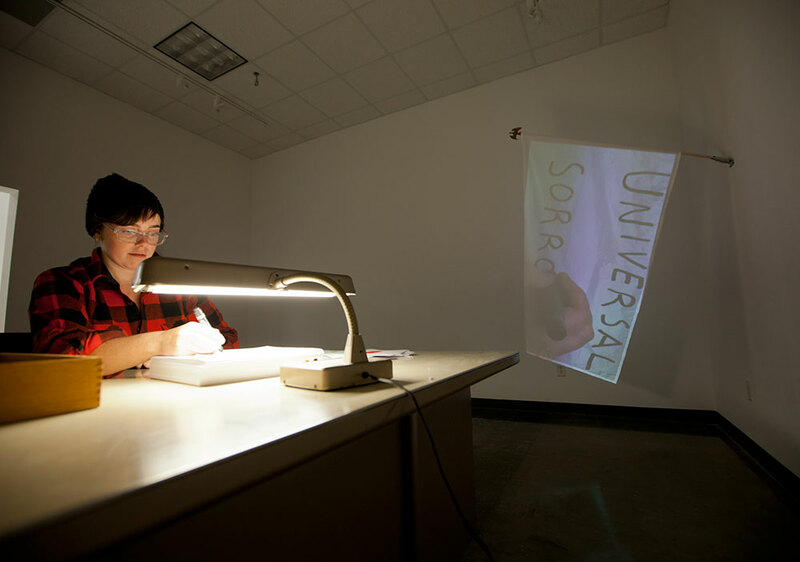 Each semester, students propose and produce a final project for Media Art Lab drawing on themes presented in the course and their own interests and practices. This work varies widely in aesthetic and approach; all is subject to rigorous iterative evaluation and critique of the final project. Denzel Bingaman (BFA, Graphic Design), “Running,” Fall 2014. Naoki Izumo (MFA, Intermedia), “My Video Diary,” series of video vignettes, Fall 2014. Sarita Zaleha (MFA, Printmaking), “Collapse/Clap,” video installation, Fall 2014. 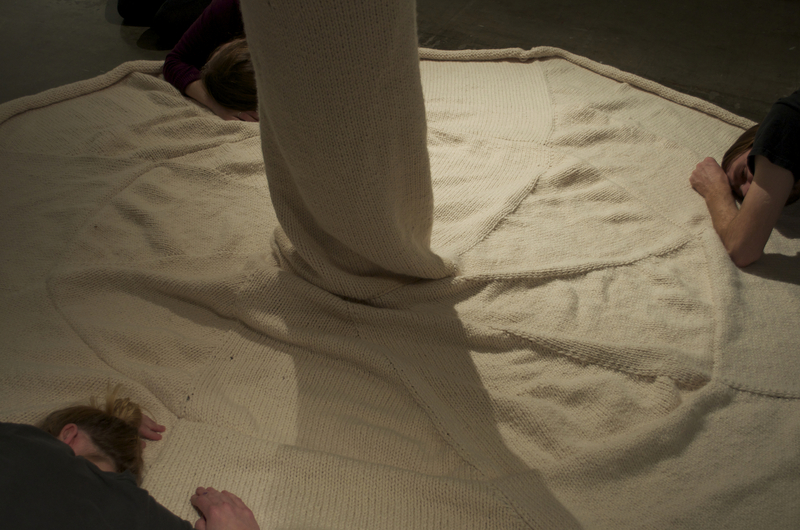 Rachel Livedalen (MFA, Printmaking), “Spectre,” performance with audio recording, Fall 2012. Play audio from this performance. Originally displayed through speakers hidden in the skirt of the knit garment. Erica Blair (BFA, Intermedia), “Downstream,” 20-minute documentary video, Fall 2012. Terry Quinn (BA, English), “It’s Lonely at the Top,” experimental digital animation, Fall 2012. Ian Etter (MFA, Drawing), experimental animation using drawing techniques, Spring 2012. Katie Hargrave (MFA, Intermedia), “My Ronald Reagan Collection,” 7-minute video essay, Fall 2011. Brendan Wells (BFA, Intermedia), “Three Percussive Sounds,” chance-audio installation, Spring 2010. Sample audio from “Three Percussive Sounds.” Snaps, claps, and stomps, each played on a different tape loop and amplified together on a stereo, occur in dissonance with gaps of silence and in chorus if recordings overlap. Greg Soukup (BFA, Intermedia), “Datamosh Performance,” MAX/MSP performance on video game violence, Spring 2010. Lisa Edwards (BFA, Intermedia), “Roller Derby: It’s Kind of a Big Deal,” 20-minute video documentary, Spring 2010.